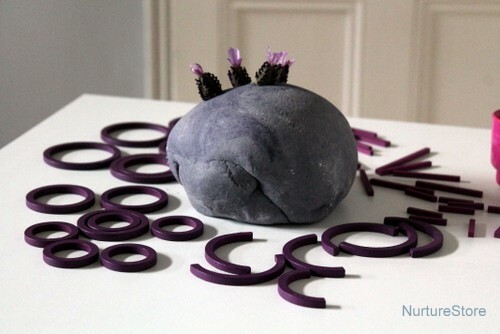 This easy to make homemade lavender playdough recipe is wonderful for calming, soothing sensory play, and is one of the favourites that’s included in my ebook The Homemade Play Dough Recipe Book. 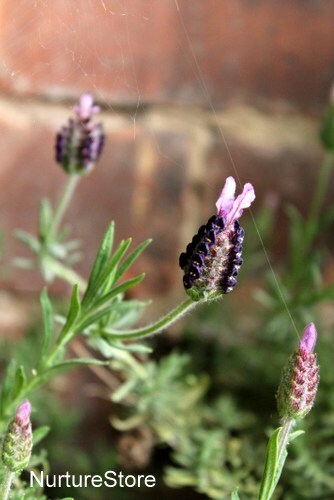 Our lavender plants are just coming into flower in our Garden Classroom this month and are already smelling wonderful. 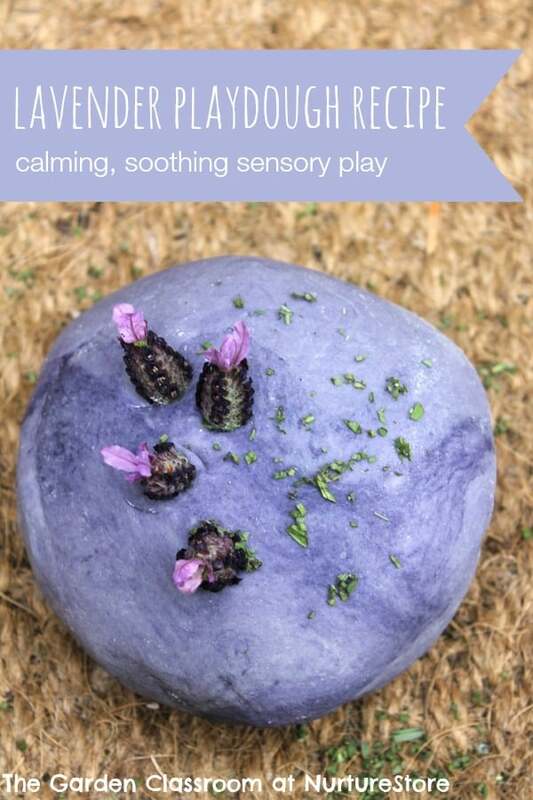 Lavender is a very calming and soothing scent, making it a good addition to all sorts of sensory play. My children often snip little bits of the plants to add to the recipes they are making in their mud pie cafe, and we also use it in our bedtime sensory tub. 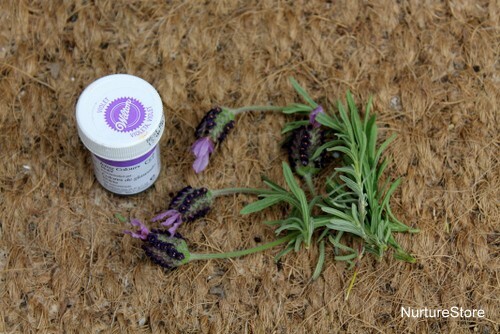 Today I’m sharing our recipe for homemade lavender playdough. I use a no cook play dough recipe for all our dough as it’s so simple to make. If you download The Homemade Play Dough Recipe Book you’ll find a whole year’s worth of play dough activities that cover maths, literacy, art and play, using lots of different variations on this classic recipe. For today’s lavender playdough, I’m using two cups plain flour, one cup of salt, two tablespoons of vegetable oil. To add the lavender colour I’m using a little purple food colouring gel. 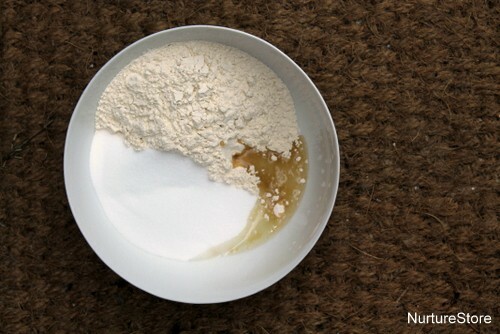 You can add the scent in a few different ways, depending on your preference. 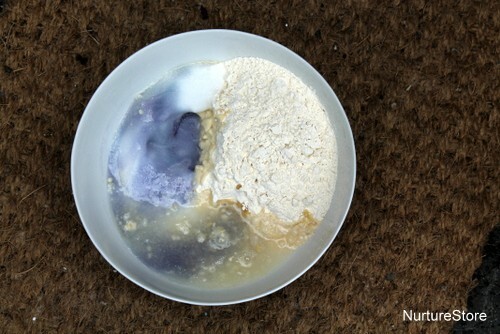 The dough has a beautiful colour and scent and is just wonderful for sensory play. Kneading the dough is a great workout for little fingers that are developing their fine motor skills. And as you play you are releasing the soothing fragrance. 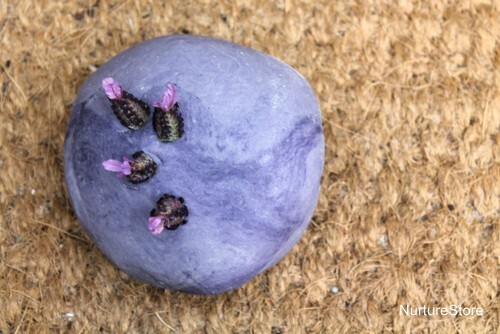 Playing outdoors always has a therapeutic effect on my children, and combined with this lavender playdough we’re really on to a winner. The dough is a good addition to a mud pie outdoor play kitchen, where you can use for some pretend play baking. You can also find some interesting leaves and flowers around the garden and see what prints you can make in the dough with them. This playdough is also a good way bring the outdoors in, as you can carry the scent of the garden inside. 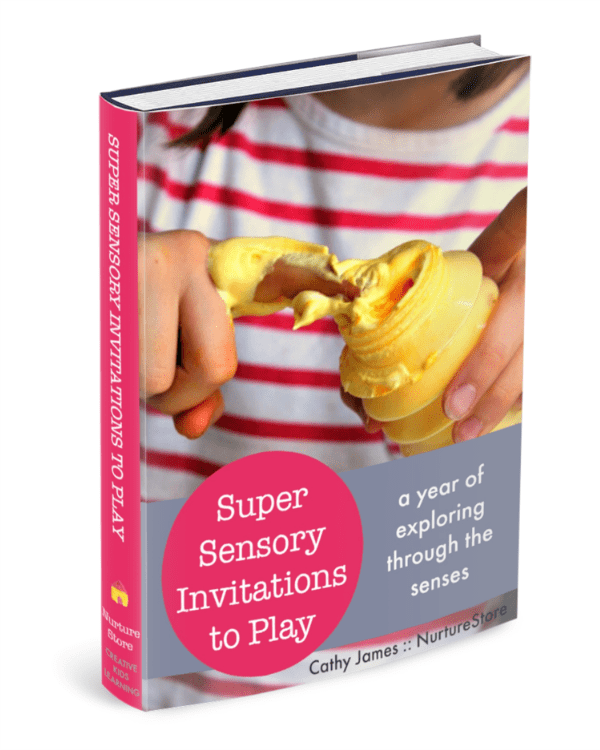 Set up an invitation to play using the lavender playdough, some flowers from the lavender plants, combined with some loose parts all on a purple theme, and see what your children create.